For my project on computer simulation, I decided to focus my project on the children’s toy Mr. Potato Head. Mr. 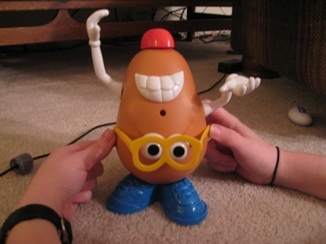 Potato Head allows children to explore their creativity by placing body parts and accessories in a toy potato in any configuration they wish. With twelve parts included and nine positions on which parts can be placed, there are literally tens of thousands of possible ways Mr. Potato Head can be assembled. I became curious as to how I could apply simulation techniques to search through the space of possible Mr. Potato Head assemblies. In particular, could I figure out which configuration of parts makes the most “awesome” Mr. Potato Head? 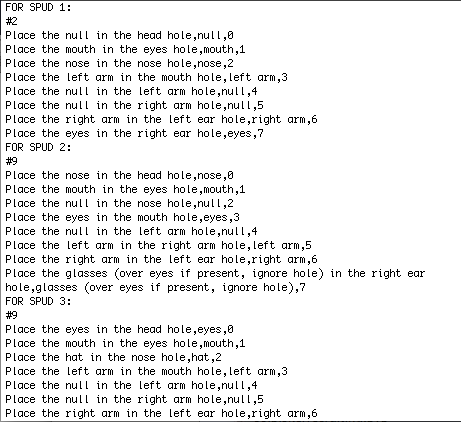 These 10 initial spuds were produced by an algorithm (developed in Processing) that would go through each hole on the body, one by one, and either place a part on that hole in the body (chosen at random) or leave that hole empty. Special rules had to be created for the Hat, Moustache and Glasses parts, given their unusual physical operation – the hat could only be placed when it was placed on the head hole (causing the hat to be extremely unlikely), the glasses could only be placed when the eyes are also present (causing glasses to appear fairly infrequently), and the moustache would always be placed under the piece called for previously (making the moustache itself somewhat common, but any particular combination of moustache and specific part hard to pass on). This produced a set of directions on how to create the initial 10 Mr. 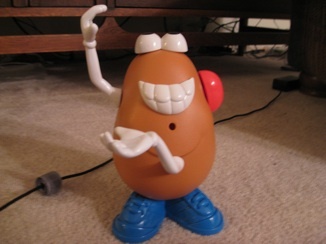 Potato heads, output in a text file in the format shown below. In addition to construction instructions, the file also contains # signs for each spud, which mark placeholders for me to type in information about that spud later. With these instructions, me (and my girlfriend) constructed each of the 10 configurations and took a picture of Mr. Potato Head in that configuration. This allowed us to “realize” each Mr. 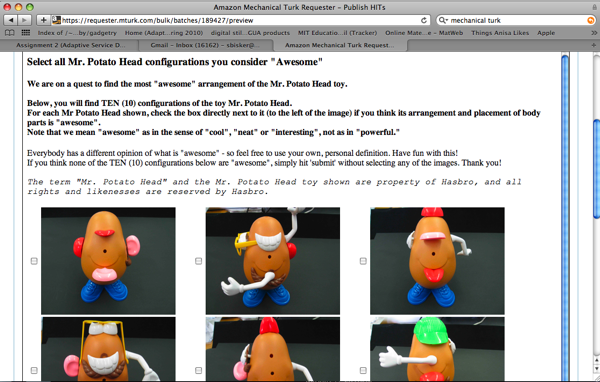 Potato Head specified by the algorithm. Then, with all ten configurations photographed, we uploaded those photographs to Mechanical Turk and paid people for their opinions on them. We instructed 20 Turkers to look at all 10 configurations and tell us which ones that they considered “awesome”. We made it clear that Turkers should use their personal judgement and opinion in deciding which (if any) were “awesome”, with the only stipulation being that they interpret the word “awesome” as “cool, neat or interesting, not as in powerful”. These votes on the Mr. Potato Heads from the Turkers were tallied and used to rank the various configurations against each other. The four Mr. 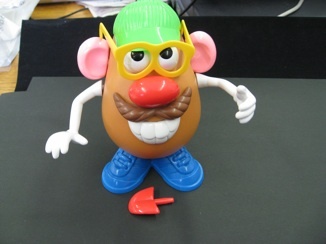 Potato Heads receiving the most votes are then chosen to “reproduce” with each other and themselves, in order to create the next generation of spuds. With no real genes to speak of, no real concept of gender, and a limited number of parts, Mr. Potato Head reproduction is a bit of an odd process. (Yes, there’s Mrs. Potato Head, but we’ll leave her as an exercise for the reader.) For each hole on the child, a coin is tossed, and depending on the outcome the mom or the dad is allowed to place their part in that hole into the child. If that part has already been used in a previous hole, the dad places his part in the hole instead, and if that is not possible, the hole is left empty. 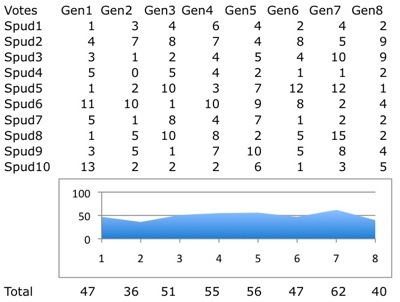 There is also a 20% chance of “mutation” for any given hole, which means that the contributions of both parents are ignored and the hole is instead filled with a piece at random still available for the body (or, sometimes, is left empty). 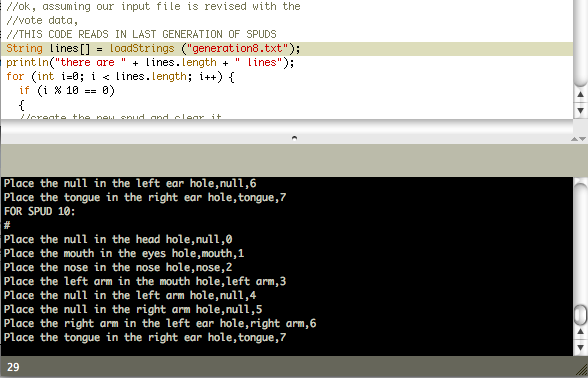 An example of this evolution in progress (as shown through debug code) can be seen below. The row of numbers at the top of represents the algorithm taking in the vote counts, sorting them and picking the best four spuds for reproduction. *People really find it “awesome” when the hat is on top, and when the glasses are on the eyes. Those are two recessive traits, as they only occur when two parts are pulled up in combination – but when they do occur, they tend to survive to the next generation. However, as the chart of votes below shows, it seemed that people did not mark more spuds as awesome in later rounds as in earlier rounds. The top-scoring spuds in the later rounds got a similar number of votes to the top-scoring spuds in earlier rounds. However, this may speak more to how people restrain their praise in surveys than the “absolute” level of awesomeness present. *When performing this experiment, I really felt like I was building based on a script, and that a computer was telling me what to do. At the same time, the Turkers were expressing quite a bit of autonomy, even having a lot of fun with the assignment (see Turker comments below.) This caused me to feel like I was the one doing the work for the Turkers, not the other way around (despite me paying them for their efforts.) The people at Threadless do very similar work to this, making shirts based on the orders of an online community of designers and voters – but somehow this process feels depersonalized, and I don’t feel like the “curator of community” that Threadless makes themselves out to be. Perhaps it’s because it is evolution, luck, making the final calls as to what an “awesome” spud means in terms of how votes influence the next round, not solely the votes of the Turker community themselves. Below is just some of the feedback and comments I got on this experiment from Turkers. Full feedback is included in the code download. Hi Sol – here are the comments from the class crit. Impressed with the process. Must have been really tedious to build all the potato heads and take pictures. A thorough, unusual and inventive process. This project has interesting bearing on manual fabrication as a digital fabrication process driven by crowd-sourced design. Did ‘awesome’ vary based on Turker’s locations, ages, etc? The script is good for generating random configurations that I wouldn’t normally think about.